Puppies are very susceptible to contracting diseases that older dogs’ immune systems can fight off. Giardiasis and coccidiosis are both parasitic infections that are common among young dogs. Up to half of young puppies will contract giardiasis in their life. Both conditions are easily treatable. Both are common in parks, kennels, doggy day care and other areas dogs frequently visit. Your puppy can get giardia many ways such as chewing on a stick, eating grass, or drinking from a puddle. Refrain from taking your puppy to these places until he is at least 12 months old. It's important to understand that coccidia can be found in the stools of normal dogs. All dogs have some level of Coccidia in their gut. They just flare up at times of stress (i.e when pups are weaned, shipped , changing to new environments, changing food, ect...). The stress can cause the Coccidia to bloom and flair up causing diarrhea. Once a dog is diagnosed with coccidiosis there are a couple of options for treatment. Dogs can be treated with coccidiostats. Albon (Sulfadimethoxine), Trimethoprim-sulfa (TMP-SMZ), or Corid . Your vet may recommend 5 + days of treatment or a cycle of treatment.The important thing to keep in mind about these drugs is that they do not kill the coccidia that your dog already has, they just stop coccidia from reproducing. The dogs must rely on their immune system to clear the parasite after treatment. People ask what coccidia is and how their dogs become infected. Coccidiosis is an infection of the intestinal tract by one-celled protozoa. Coccidia spend a portion of their life living in the intestines of the infected dogs. The parasite is transmitted to other dogs in any number of ways such as eating stool, licking feet after walking on parasite, flyies, cats, or people tracking it mechanically are just a couple of ways. Picking up stools is part of a preventive program. Preventing this parasite can be difficult with litters that live in small areas and places people or other animals frequent often. It can be picked up every easily at a dog park, pet store, shelter, and public dog places. Coccidia eggs can live in the environment for two years - so disinfecting to keep levels down is important. Steam cleaning is by far the best way to disinfect. The ONLY OTHER WAY to kill coccidia is to use a 10% ammonia solution (Bleach will NOT kill it) - but ammonia can not be used when the dogs are present - this is important you must move the pup elsewhere while cleaning. Coccidia is not transmittable between species, each species has there own form of coccidia. Giardia is another common single-celled parasite that lives in your dog’s intestine causing diarrhea. It sometimes infects older dogs but more frequently infects puppies. Dogs become infected when they swallow Giardia that may be present in water or other substances that have been soiled with feces (i.e. puppy toy that was on the gound where parasite was, stagnant water where insects may transmit it to, water that has been walked through or played in by other dogs, mud puddle at a park or anywhere, often just from walking in areas dogs frequent after rain!). 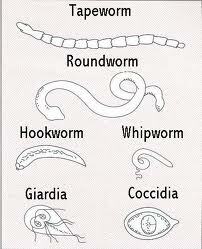 The parasite is aquatic and loves any water source it can get in. Many dogs infected with Giardia do not get any disease. Periods of stress may cause these organisms to multiply resulting in symptoms of a dog that was previously symptom free. Giardiasis, the illness caused by Giardia infection, usually results in diarrhea. Having giardiasis for an extended period of time can cause weight loss; generally poor condition; and even death in very serious cases. Once a dog is diagnosed with Giardia the vet will prescribe one of several options. Many will use Fenbendazole for 3+ days (ie panacur or Safeguard). Other options are Metronidazole (flagyl) for 5+ days or Albenazole 2+ days. The best way to prevent Giardia infection is to make sure that your dog has safe, clean drinking water, and wipe paws after visits to vet, dog park, etc. It is important not to allow dogs to drink water from areas where other animals have left their feces (ie off the ground like a puddle). Baths to get parasites off of the fur especially if puppy has been through muddy areas also helps as dogs groom themselves and then lick the parasite into them. Picking up the feces left by your dog immediately and placing it in the trash. Cleaning is important to preventing the spread of this parasite also and you will need to use bleach at 1:10 or even 1:5 water ratio, lysol brand II or III, or quaternary ammonium disinfectants to kill. Giardia can live up to 10 years in the ground.